Sometimes you just want to pluck his string. 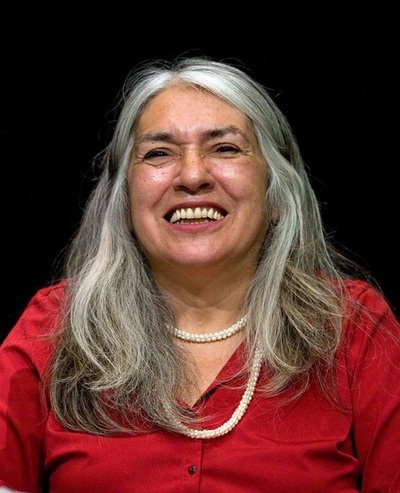 LEE MARACLE is the author of a number of critically acclaimed literary works including: Sojourner’s and Sundogs [collected work of novel and short stories], Polestar/Raincoast, Ravensong [novel], Bobbi Lee[autobiographical novel], Daughters Are Forever, [novel] Will’s Garden [young adult novel], Bent Box [poetry], I Am Woman [creative non-fiction], and is the co-editor of a number of anthologies including the award winning publication, My Home As I Remember [anthology] Natural Heritage books. She is also co-editor and contributor of Telling It: Women and Language across Culture [conference proceedings]. Ms. Maracle is published in anthologies and scholarly journals worldwide. Ms. Maracle was born in North Vancouver and is a member of the Sto: Loh nation. The mother of four and grandmother of seven Maracle is currently an instructor at the University of Toronto. She is also the Traditional Teacher for First Nation’s House and instructor with the Centre for Indigenous Theatre and the S.A.G.E. [Support for Aboriginal Graduate Education] as well as the Banff Centre for the Arts writing instructor. In 2009, Maracle received an Honorary Doctor of Letters from St. Thomas University. Maracle recently received the Queen’s Diamond Jubilee Medal for her work promoting writing among Aboriginal Youth. Maracle has served as Distinguished Visiting Scholar at the University of Toronto, University of Waterloo, and the University of Western Washington. Celia’s song [novel]. Work in progress Memory Serves and other Words [creative non-fiction]. Just received the Ontario Premier’s Award for Excellence in the Arts.